The Mapp of Clichy is the digital counterpart of the town and its urban projects. In actual fact, it was quite some time ago that the town of Clichy began developping a scalable 3D model that will allow users to immerse themselves in the town of the future. Mappr represents the enhanced translation of this model for the Internet using general public. Aggregate data in Mappr and create new services for citizens and businesses. 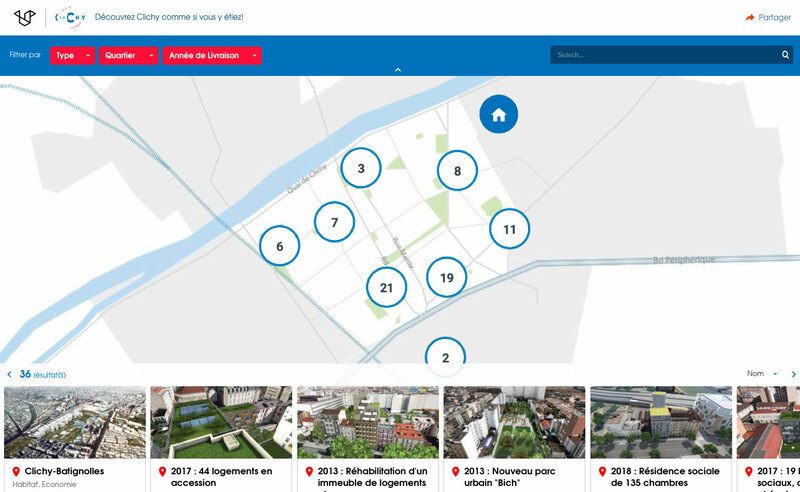 You can thus create your Mappr to find accommodation, offices, a free parking place or to participate in civic life: consultation, opinion-gathering, civic-tech. Mappr can be operated alongside large global data indexing systems. You can make use of Big Data and Open Data to bring your town/city to life in duplicate! Make your area a SmartCity! Mprs open source API and libraries mean that it can be integrated into various information systems. Software and computer services companies and innovative start-ups can enhance your Smart City using Mappr, and create new uses.